I never have an issue choosing a gift for my mom, sisters or daughters. They are usually pretty clear with their wish lists and are easy to buy for. It’s the men in my life that I have trouble with. I have always had an issue deciding what to buy my dad and now that I’m with John, I’m having the same dilemma! I recently discovered Real Man Gifts, a site that caters to providing awesome gifts that men will want and actually use! Each gift set starts with six items of your choosing. If you want to include more, you can add up to 10 for an additional fee. John and I finally have our “new” barbecue and he’s been grilling up a storm in the backyard. I have to say the man makes a mean steak. I knew he would love the BBQ Master gift set. The barbecue is his domain and he needs some accessories for his new “toy”. When the BBQ Master Gift Set arrived from Real Man Gifts, John’s eyes lit up like a kid on Christmas morning. There was lots of exclamations of “Look at this!” and “How cool!”. I’d say he really liked his gift. 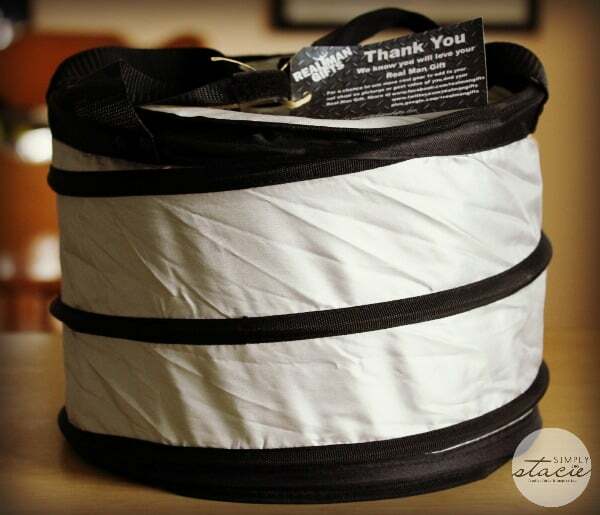 All the gear arrived in a collapsible party cooler perfect for storing cold drinks. Inside was all six gear choices I had selected for John. I had 10 items to choose from and I choose the ones that I thought he would enjoy using the most. They were items that John never even knew existed so I knew there was no way he’d ever even think to look for these products at the store. Here’s a peek at the six items I selected for John’s BBQ Master gift set. 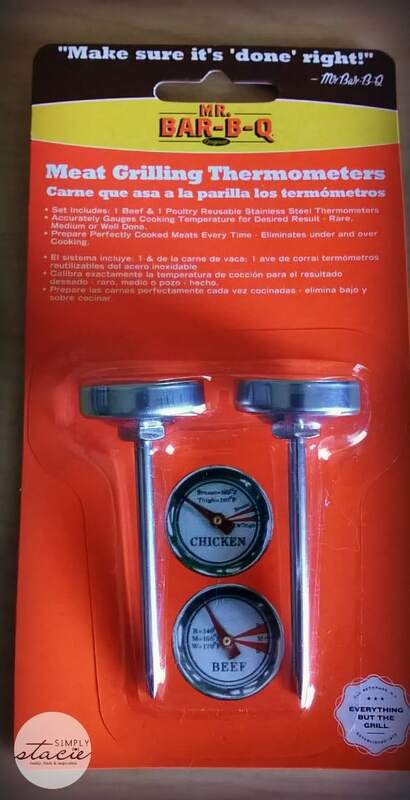 Meat Grill Thermometer: A two-pack of stainless steel thermometers with one for chicken and another for beef. It takes the guessing out of grilling! No more undercooked chicken or beef! 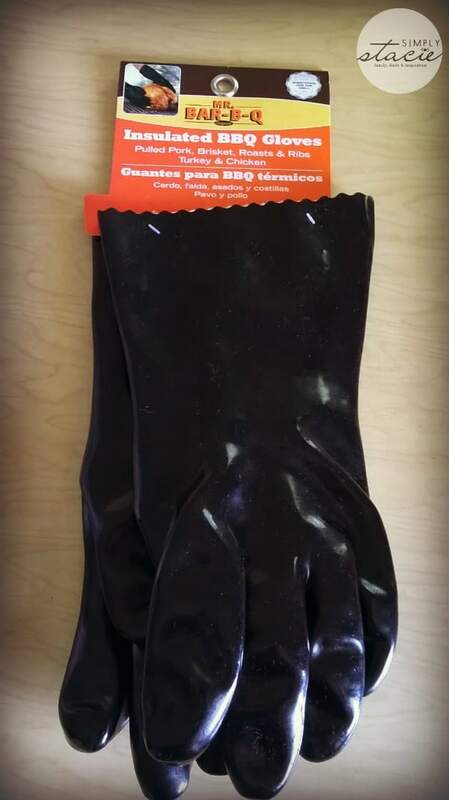 Insulated BBQ Gloves: Now John won’t burn himself when handling meat on the grill. Also, it allows you to grab a large piece of meat instead of piercing it to pick it up. 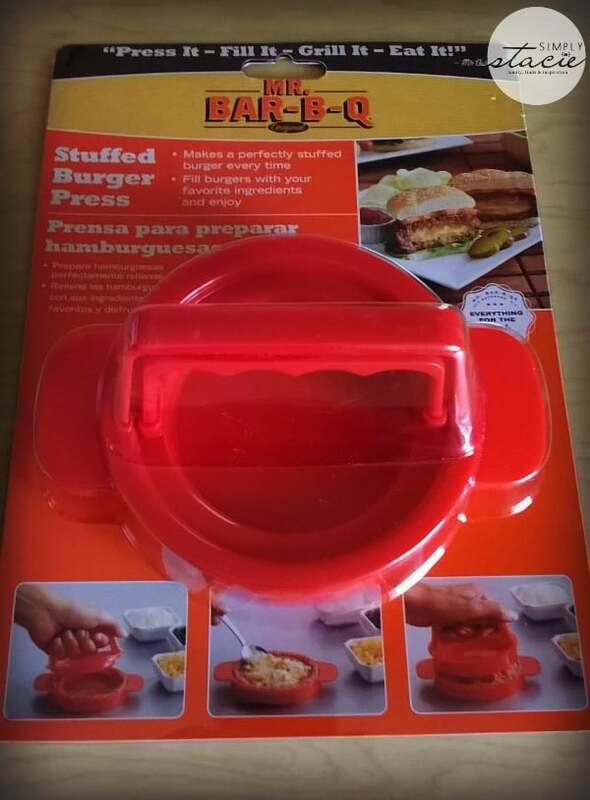 Stuffed Burger Press: Now we can make stuffed burgers with ease! Cheese stuffed burgers? Yes, please! 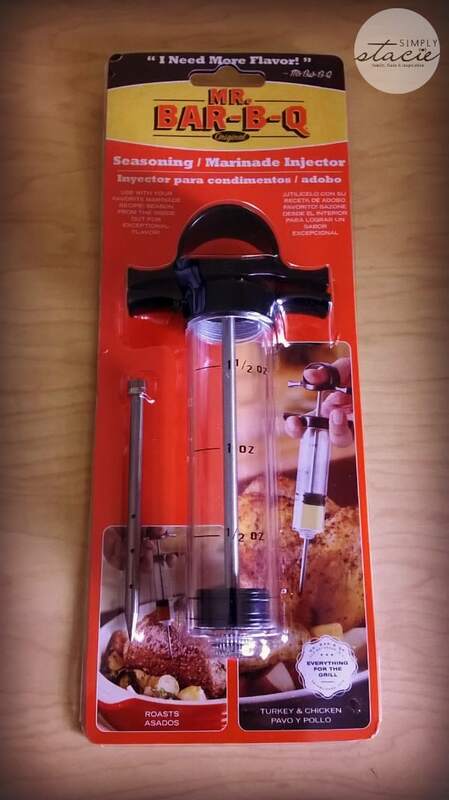 Seasoning/Marinade Injector: Instead of just basting meat, John can take flavour to the next level. 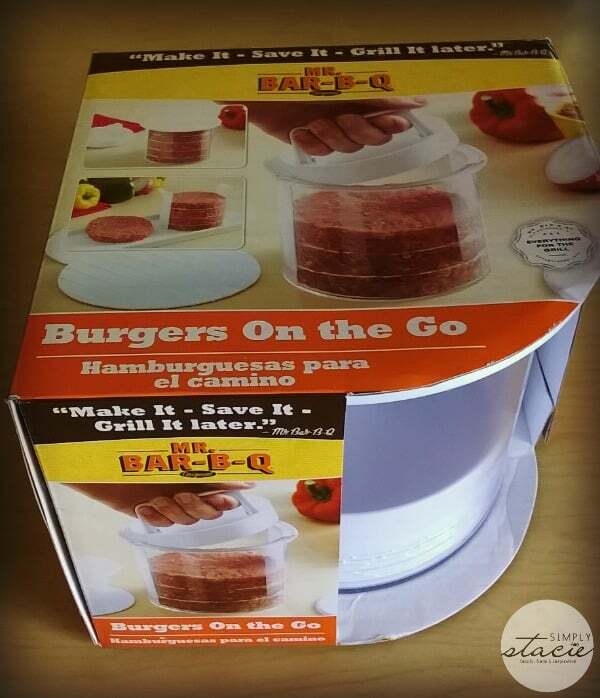 Burgers on the Go: A handy way to make burgers and store them for later. Make the burgers at home and bring them ready-to-grill to the cottage or trailer. 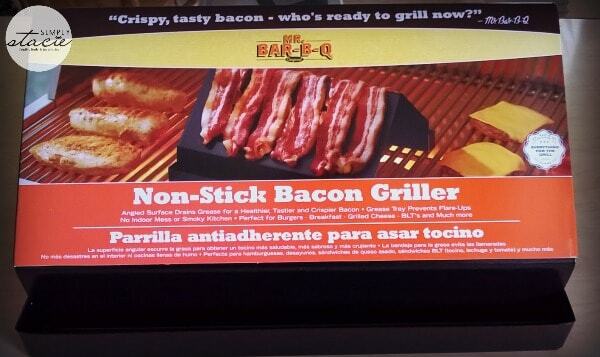 Non-Stick Bacon Griller: I’ve heard of people making eggs on the barbecue, but not bacon. 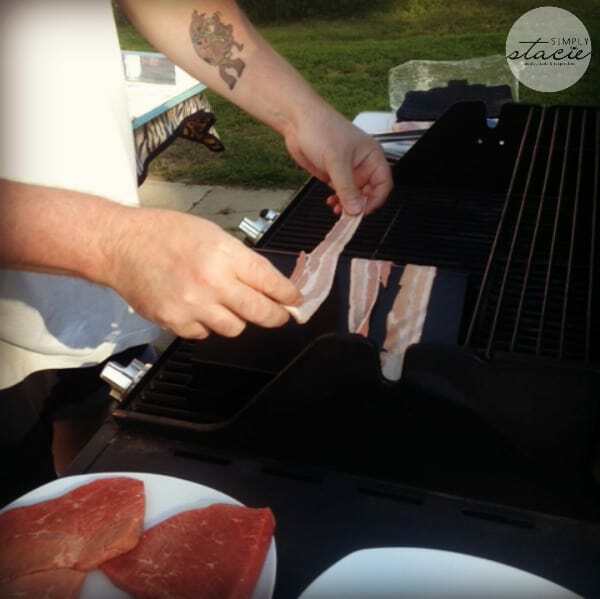 Now John has a way to cook up bacon on the barbecue without starting a grease fire! This Bacon Griller makes crispy bacon perfect as a topping for your burger or just eating on its own. It’s angled so all the grease drains away. Then just wash it in warm soapy water later on and you are ready for the next time. John said it was his favourite thing from the set. The BBQ Master set has four other products that I could have selected including BBQ Grilling Claws, Mini Magnetic BBQ Light, Smoker Box and BBQ Wood Chips. If you want to have all ten included in your set you can. You just pay a little extra for each one you want added in. 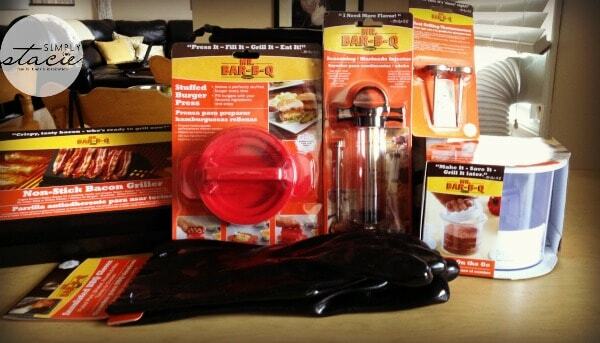 The BBQ Master gift set is $130.00 and that includes six pieces of gear of your choice. 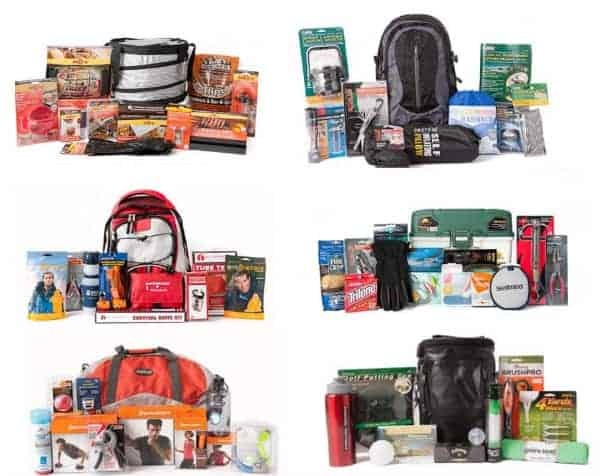 Add $15 for each additional item you include. Real Man Gifts is based in Ontario, Canada, but ships internationally. Men all over the world can enjoy these fun gift sets. My eyeing up the Golf Legend set as a gift for my dad. He’s at the golf course every week! Which set would you choose for the man in your life? I would get him the Fishing Pro set. Definitely the Fishing Pro- that is all we do!! I would go for the camping king for my husband. Or BBQ master. Neat stuffs!